Created from a mixture of fish and forest fines. This top-quality product is rich in colour and in nutrients while maintaining a neutral pH. SEA SOIL™ contains all necessary micro and macro nutrients to grow a healthy garden, is weed-free, and is an excellent way to retain moisture. SEA SOIL™ is listed by the Organic Materials Review Institute (OMRI). With no fish odour, this two year composted soil is a complete soil for your garden. See Original SEA SOIL™ in action at the SEA SOIL Photo Gallery! Available in 32 L bag. Also sold in bulk at selected dealers. 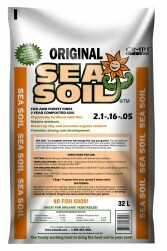 SEA SOIL™ is a complete soil that will change the way you garden. The rich black soil is full of micro-macro nutrients and trace elements to enrich your soil quality. Time between watering will increase. Fertilizers and other supplements can be eliminated. When using SEA SOIL™ with other supplements, follow the directions of all products being used. POTTING: Blend with your existing soil to fertilize and improve soil conditions. TRESS AND SHRUBS: Blend SEA SOIL™ around base of tree or shrub at a desired thickness to naturally fertilize or plant directly into SEA SOIL™. TOP DRESSING MULCH: Apply a desired thickness of SEA SOIL™ to your plant bed or garden to protect and fertilize. LAWNS: Rake in SEA SOIL™ evenly in the area to be fertilized or patched. Follow grass seed directions if seeding. SEA SOIL™ is excellent for retaining moisture. Water when soil is dry throughout your container and always have a water collection device if overwatering occurs. Excessive watering may result in a murky coloured water which is characteristic of SEA SOIL's™ natural benefits of not being chemically fertilized. Recycle the excess water back into your plants. For a complete nutrient analysis, contact us at 1-866-732-7645.